Kawanakajima (川中島) is located in north Nagano Prefecture. Kawanakajima is one of the most famous battle spot where Takeda Shingen ( 武田信玄) and Uesugi Kenshin (上杉謙信) had battles for 5 times from 1553 to 1564. It is considered as one of the most famous and major battle ever happened in the history of Japan. The most famous battle of Kawanakajima is the fourth battle which happens in 1561. What people consider of Kawanakajima is this battle. It is called the Battle of Hachimanbara. 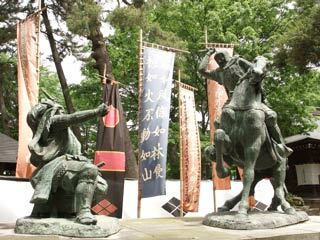 There are the statues of Takeda Shingen and Uesugi Kenshi at Hachimanbara park. The legend said there was the face-to-face battle between Shingen and Kenshin here. All the spots are located around the Hachimanbara park.